34 (38, 42, 46, 50, 54, 58)” / 86.5 (96.5, 106.5, 117, 127, 137, 147.5) cm bust circumference , buttoned with 2¼” (7 sts) overlap. Shown in size 42” / 106.5 cm with 6½“ positive ease. rows, then the sleeve is worked in the round to the wrist. long-tail cast on, knit/purl combinations, increasing, decreasing, short rows, three-needle bind off, kitchener stitch/grafting, picking up stitches, working in the round. 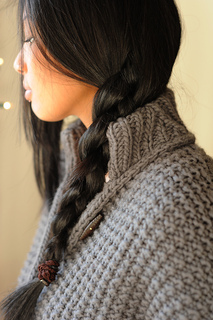 tutorial links provided for the long-tail cast on, kitchener stitch, and three-needle bind off. written instructions provided for short rows.